Fit-Ink: Fit-Q: What did Santa bring you for Christmas? Fit-Q: What did Santa bring you for Christmas? By now the presents have been opened, the stockings emptied, and the stomachs stuffed with holiday breakfast, dinner and all the snacks in between. So the all important question that's on most people's inquisitive minds is what did Santa bring you for Christmas? 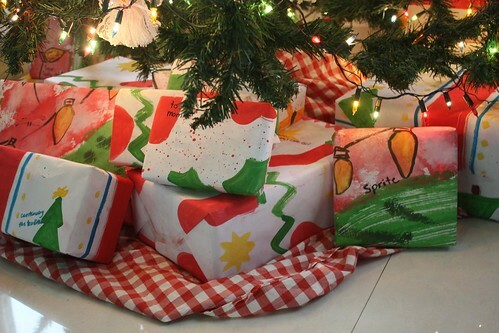 Being that we like to talk about fitness, we're wondering what fit finds found their way under the tree this year. Was it that new Garmin that you wanted to track your runs? The road bike you'd been eyeing all year but couldn't justify purchasing on your dime? Did your parents or mate outfit you with new racing gear? I could go on, but it's no fun to only list items I've received over the years. I need some new hints for my wish list, and want to hear from others. Please share in the comments! And hope you had an enjoyable holiday! Photo grabbed from jimmiehomeschoolmom at flickr. Will the Biggest Losers Run a Marathon? What's your strangest race reminder?